Hello everyone! 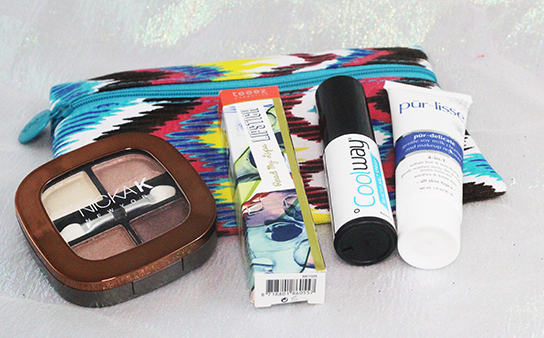 Here is my July Ipsy Glambag! It has 5 products(I forgot to photograph the tweezers) that are all really summery. I was slightly disappointed with this bag because they sneak peaked us some products that we might be getting and one of them was an Essie Nail Polish and the other was a Tarte Bronzer, both of which I really wanted but I did not get. But I do think I still got some really awesome products! The bag was pretty cute this month. It is very colorful and very summer. I do think I liked last months bag better, just because I am a sucker for black and red! Alrighty! 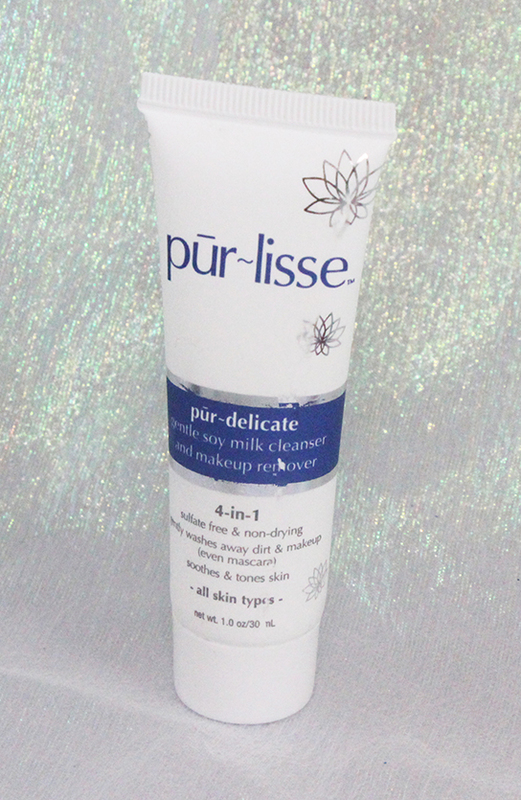 So the first product I got is Pur~lisse Gentle Soy Milk Cleanser and Makeup Remover. It claims to be Sulfate free and non-drying. I actually really like this cleanser. What I have been doing is using my Simple Whips to remove my eye makeup and I use this to remove my face makeup and to cleanse my face. This is really gentle and does really good at cleansing and it really leaves my skin feeling moisturized after. BUT I did get a pretty bad breakout after using this. I am unsure if this is the cause because I have been trying out a few other skin care products so who knows. 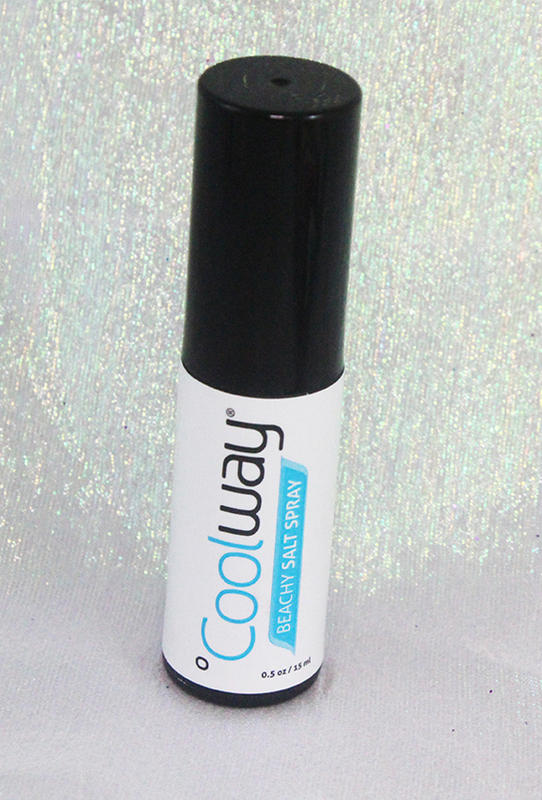 Next is the Coolway Beach Salt Spray. To be honest I only used this once and immediately just put my hair up because it just made my frizz worse. I would probably use it on the beach but not for everyday. Next we have a Read My Lips Lipstick from Teeez in the shade Killing Me Softly. This is a nice pink peach shade. I did claim to have a unique sheer matte formula, but I am not a fan. Be matte or be sheer don't be both. 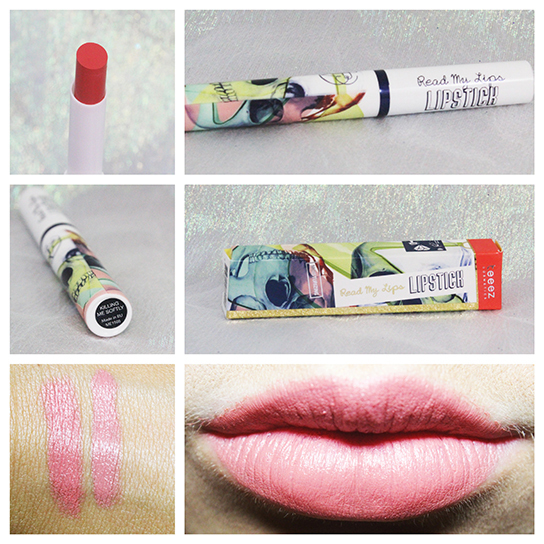 This formula is matte but slides around on the lips a lot. 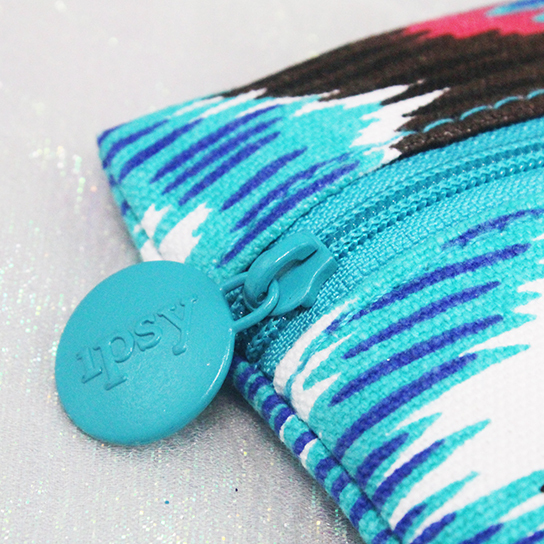 I prefer my Coloupop Lippie Stick in Button(which is pictured on the right in the swatch). 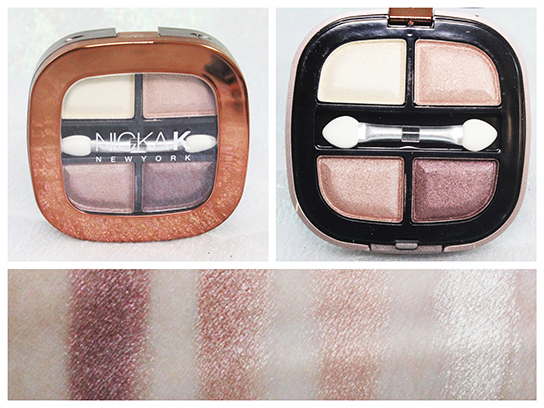 Last we have Nicka K New York eyeshadow quad. I am unsure of the shade because It is not on the packaging and also unsure of each name color. BUT they are pretty. My favorite shades of the quad are the lightest and the darkest shades. The middle too are very similar to each other. These are all SHIMMERY. HIGH shimmer, a little too much for me. I would like the palette more if there was a matte shade thrown in there but oh well. It is good for traveling and for the quick touch up of shadows because they are all neutral shades. 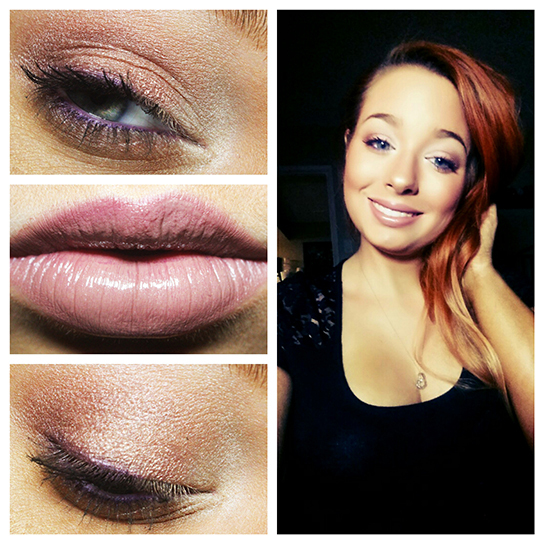 And here is a look I did using the eyeshadow quad. Urban Decay Primer Potion in Eden all over the lids, the eyeshadow quad is the only shadows I used. The 2 lightest all over the lid, the medium shade in the crease, the darkest shade in the outer v and smudged into the lashes and the lightest shade as a highlight. Sephora Collection Waterproof Eyeliner in Purple Stilettos in the waterline and smudged into the lashes. Finished off with my Maybelline Pumped UP! Colossal Mascara in Blackest Black. Monistat Chafing gel as a primer. Then combined Elf Tinted Moisturizer in Sand and Smashbox Camera Ready BB Cream in Light for my foundation. For concealer I used my Coastal Scents Camo Concealer Palette. To set everything, since I have fresh tan on I used my Wet n Wild ColorIcon Bronzer in Ticket to Brazil. Bronzer is Elf Mineral Bronzer in Caramel Cabana. Blush is Elf Mineral Blush in Cabo Cabana. Highlighter is Elf Bronzer in Sunkissed and Elf Shimmering Facial Whip in Golden Peach. Coloupop Lippie Stick in Tootsi with NYX Lipgloss in Sugar Pie on top.